She joined the University in 1994 as the hostel supervisor and in the year 2002 she was appointed as the Domestic Bursar to date. She has a Certificate in Rural Domestic Economy, Secondary Teacher’s Certificate from the National Teacher Training College and a Diploma in Pattern Designing and Dress Makers. 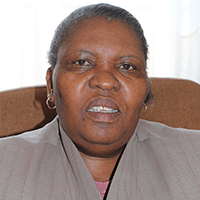 She also has a Diploma in Adult Education and Bachelor of Education in Adult Education from the National University of Lesotho. As the Domestic Bursar she serves several committees of the University namely the HIV and AIDS committee, Council Sub- committee on Tenders, Board of Finance risk control, the NULIS school board and Board of Survey. The office is mandated to ensure that teaching and learning environment is conducive through interior cleaning of the classrooms, halls of residences, offices and occasionally cleaning of the staff houses immediate surroundings and windows. The university has outsourced most cleaning activities and privately owned companies have been engaged to ensure cleanliness on campus. In-house cleaners have a limited area to take care of while the IEMS Regional Centres are services by casual cleaners. Hostels: The unit takes care of cleanliness in classrooms, halls of residences, offices occasionally cleaning of the staff houses immediate soundings and windows. Laundry: The Laundry unit mainly deals with laundering of University linen, Laundering offices, halls of residences and staff housing curtains, laundering the university sporting attire, sewing of university curtains and sewing of academic hoods.